DemosCAD LT is a skills-based application built around Autodesk AutoCAD software to equip high school students interested in pursuing technical courses such as Architecture, Design or Engineering with AutoCAD skills that are now critical for those who join University to pursue those courses. 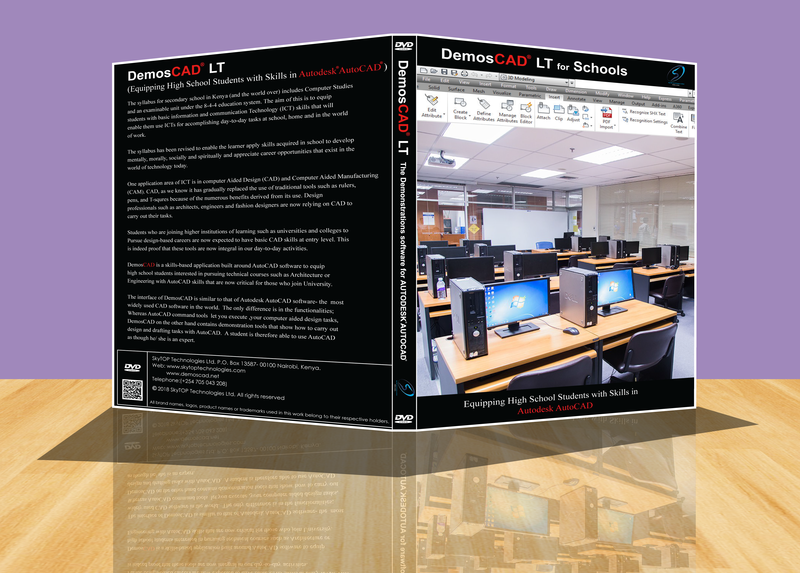 DemosCAD LT is a skills-based application built around Autodesk AutoCAD software to equip high school students interested in pursuing technical courses such as Architecture, Design or Engineering with AutoCAD skills that are now critical for those who join University to pursue those courses. With an interface that is similar to that of Autodesk AutoCAD software, DemosCAD LT demonstrates virtually all the command tools of Autodesk AutoCAD thereby letting students work with AutoCAD as experts. The interface of DemosCAD LT is similar to that of AutoCAD, the only difference is in the functionalities; whereas Autodesk AutoCAD command tools let you execute your Computer Aided Design (CAD) tasks DemosCAD LT on the other hand contains demonstration tools that show students how to use the tools and commands in Autodesk AutoCAD. The Interface is similar to that of Autodesk AutoCAD software and let students utilize the tools of Autodesk AutoCAD software without getting stranded. While the tools in Autodesk AutoCAD execute design commands, similar tools in DemosCAD LT execute ‘demo’ command tasks. Project Demos; DemosCAD LT also contains sample tutorials on how to carry out design projects using multiple Autodesk AutoCAD tools and commands. Applications Window; This feature, among other benefits, contains tutorials on how to use AutoCAD software. The Gallery Browser; It showcases fascinating work created using Autodesk AutoCAD in order to inspire students to learn AutoCAD and use it to carry out their design and related tasks. So, if you are a high school student interested in pursuing technical courses such as Architecture, Design, Engineering, Construction or Surveying, and you would like to optimize in your use of Autodesk AutoCAD software, then DemosCAD LT is designed for you.